Fertile soils and favorable climate contribute to the impressive production of cabbage in New York State. With more than 12,000 acres grown annually, New York ranks in the top three states nationally for both fresh market and kraut cabbage. Fresh cabbage is sold in retail and wholesale markets and is used for cole slaw, egg rolls and other products. 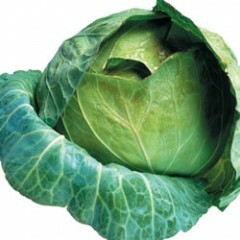 Under the proper conditions, cabbage can be stored through April, making it available nearly year round. There are two large processors in Western, NY (Seneca Foods and Great Lakes Kraut). Kraut cabbage is harvested late in the fall. It is trimmed, shredded, mixed with salt and then fermented in huge vats. The product is then packed in cans, glass jars or sealed plastic bags. Many varieties are available for fresh market, storage and kraut cabbage. Varieties also differ in their susceptibility to insects and diseases. Cornell Cooperative Extension Educators and Cornell faculty work together annually to conduct research on many aspects of cabbage production in the state. Below you will find educational information and results of our research trials. Grading and packing guidelines are now available for 17 commonly grown specialty crops in NYS: acorn squash, broccoli crowns, Brussels sprouts, corn, green peppers, cucumbers, green cabbage, red cabbage, savory cabbage, cauliflower, eggplant, green beans, jalapenos, poblanos, Hungarian hot peppers, summer squash, and zucchini. Organic Production Guides for fruits, vegetables and dairy are available through the NYS Integrated Pest Management (IPM) program. They outline general practices for growing vegetable and fruit crops using organic integrated pest management techniques.